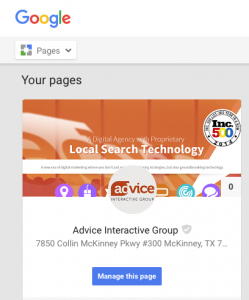 No More Manual Verification for Google My Business Listings! You can no longer call Google up on the phone and get a business verified. All businesses will have to verify through the Google My Business dashboard. “The Google My Business support teams will be declining requests for manual verification starting next week. Operators will redirect and educate users towards the official validation methods and will no longer have the mandate to manually validate businesses, except in extreme cases. While verifying over the phone was somewhat of a short cut, the online verification is not too complicated either. You can find the step-by-step guide to the verification process here: https://support.google.com/business/answer/2911778?hl=en. One of the biggest downsides of this change is waiting 14 days to receive a postcard with a verification code, which you will then enter into the Google My Business dashboard to complete the verification. While it does require a few additional steps, and a 14-day wait for the code, it is imperative that you complete the verification process for your business. Without completing this verification you run the risk of your business not showing up on maps and being dropped from desktop and mobile search results. If you have considered hiring a company to help you with the verification process, but haven’t followed up now is the time. If you haven’t considered it, maybe you should. Google will continue to make changes and having a company watching out for your best interest only makes sense. Have been verifying businesses on Google by making a phone call? How do you feel about this change?